(Trent Nelson | The Salt Lake Tribune) Utah Royals host Orlando Pride at Rio Tinto Stadium in Sandy, Wednesday May 9, 2018. Utah Royals FC forward Katie Stengel (24) leaps over Orlando Pride goalkeeper Ashlyn Harris (24). 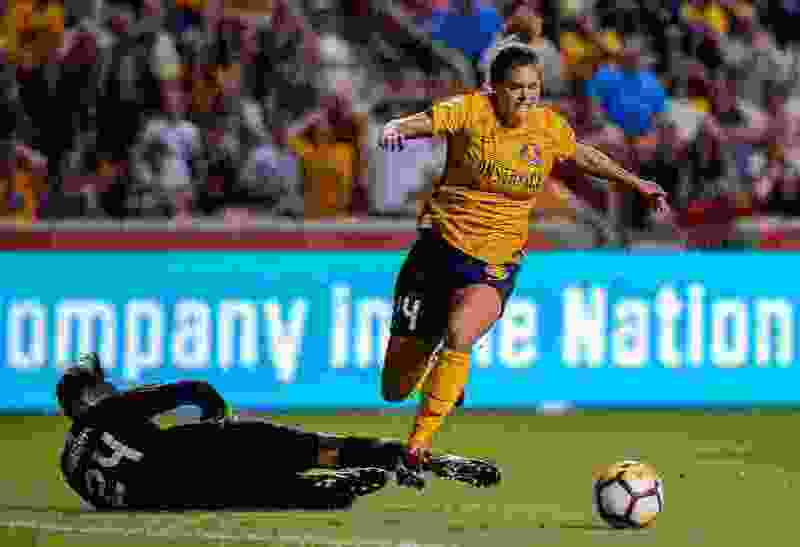 Christen Press scored in the 77th minute and Katie Stengel scored in the 83rd as Utah Royals FC overcame a halftime deficit and defeated the Houston Dash 2-1 on Sunday night at BBVA Compass Stadium in Houston. The Royals, who entered on a four-game winless streak and seventh in the NWSL, leapfrogged over the Dash with the victory. Houston scored first, with a header by Veronica Latsko off a free kick in the 41st minute. Press tied the score at 1-1 when she stole the ball from Amber Brooks — who had just received a pass from Houston goalkeeper Jane Campbell — and quickly fired it into the net. A pair of substitutes combined on the winning goal. Erika Tymrak, who entered in the 58th minute, chipped the ball over the Houston backline to Stengel, who lifted it just over the outstretched arm of Campbell for her fourth goal of the season. Stengel had entered the game 15 minutes earlier. The Royals were outshot in the game 9-5 despite having a big edge in possession, 65 percent to 35 percent. Both clubs put five shots on target.